When it comes to getting publicity for your business or yourself, it is not as easy as you may think. If you have a big budget you can pay for advertisements and advertorials in magazines, newspapers and websites, but what do you do if you don’t have the funds for such luxuries? Firstly, you could write a press release about whatever you want to publicise and then send it to the media outlets you would like to use it. The skill in writing a press release that will be used is to pick a newsworthy angle or to write it on a topic that is popular. Having previously worked as a journalist for more than 15 years, I know how to word a press release so it grabs a news editor’s attention. For example, one of my press releases last year was published in 16 different places in the media or websites. If however, you can catch on to the latest buzz topic then your press release is highly likely to be used. 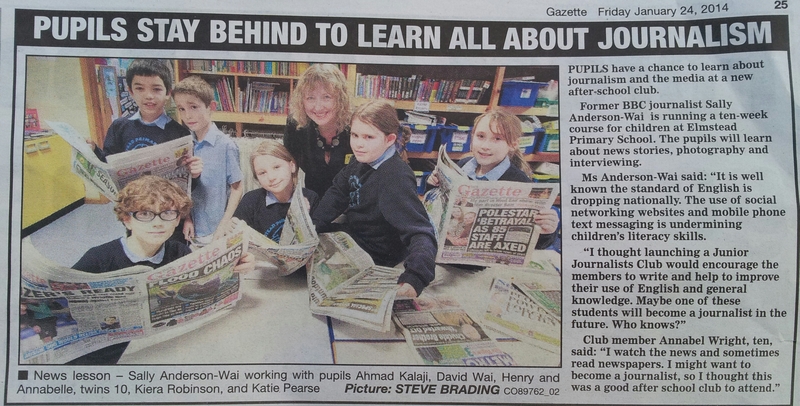 I recently started a Junior Journalists’ Club in my local school to give something back to the community. I angled my press release on the Club helping the pupils with their English, a topic often in the national media these days. The press release has been used in two local papers and on a local news website so far. Also a when I was just starting WRITE WAI PR and writing services, I sent Woman Alive an email and an article on my business appears in the January 2014 issue of the magazine. If you want to get something published, think about which outlets might use to market your news and then angle your article or press release for it. Don’t be frightened to think outside the box. If you just lack confidence or haven’t got the time, let me handle your PR for you for reasonable rates. I will use my journalistic skills and copywriting ability to get your news published in places you might never have imagined! Reblogged this on Sally's Christian Blog.